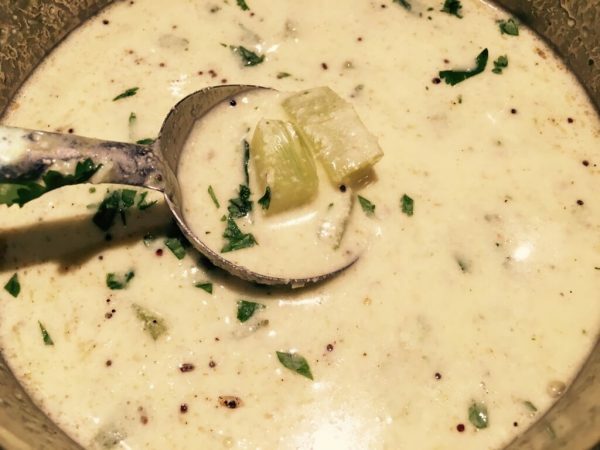 It's a rough counterpart of the kadhi made in the northern parts of India. 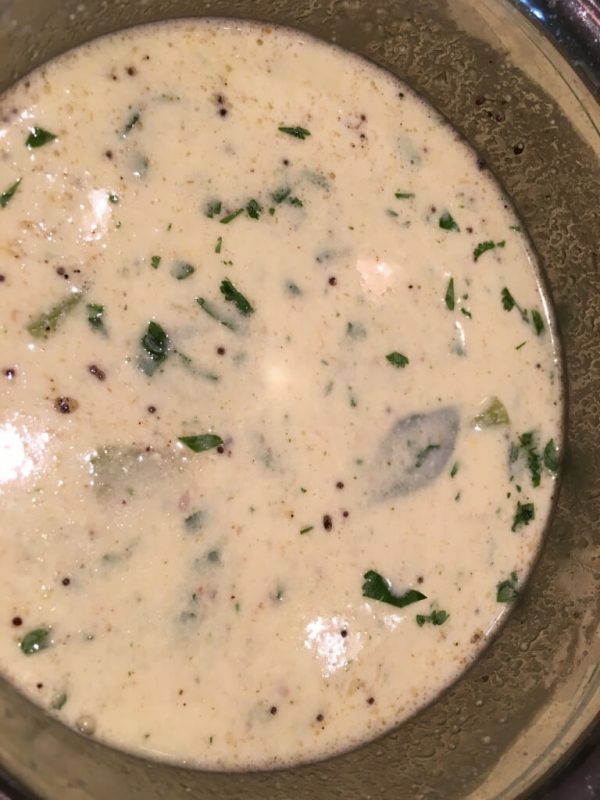 Of course, every household has its own recipes, but most South Indians would agree on more/moar (buttermilk/yogurt, sourer the better), coconut, green chilies, and curry leaves as the star ingredients that give this dish the flavor, the tang, and the heat. Tastes wonderful with rice, and this is the dish that my daughter requests at least once whenever she's home. It's important at this stage to not let it boil for too long, as the yogurt/coconut blend would curdle. Keep a ladle in the pot, keep the heat on low-medium, and keep stirring. When it looks like the gravy is about the boil over, mix it quickly, and turn the heat off. This is called a "kodhi" and my mom always told me not to let it come to the kodhi stage more than twice, and to take it off the heat at that point. Any dish with fresh coconut should not be cooked too long; make sure not to overcook the gravy and keep a watch on it. It takes just a few minutes for this to happen, and if you take your eyes off and it boils over, it would become a curdled mess. We need a smooth silky texture for this dish. 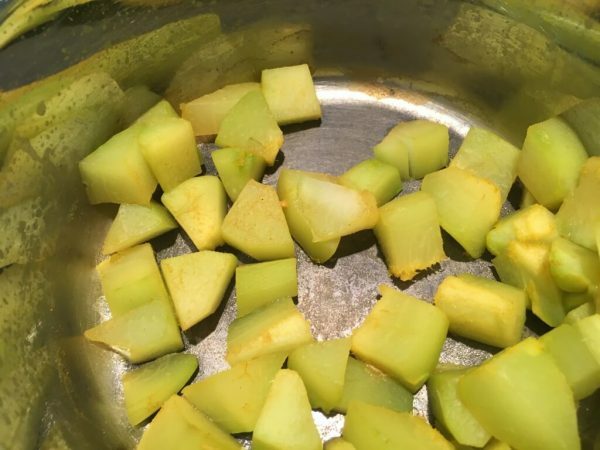 Chayote squash is the vegetable that's easily available anywhere; other good vegetables are cucumbers, ash gourd (white pumpkin), okra (to be sautéed and then used, no need to cook it in water). Vegetables that are water-based like cucumbers, ash gourd will cook in less time, so adjust cooking times. The vegetables in the gravy should be fork tender and still retain a bite to them and not be mush. If my daughter is craving this dish, and I don't have any appropriate vegetable, I have made it as a plain gravy 🙂 Whatever works! Serve this on hot steaming rice, with a side of potato fry (popular), or paruppu usili (healthy - scrambled cooked lentil, with vegetables - recipe to come soon). More kuzhambu and paruppusili is a delicious combination, and important members of every festive tambrahm menu! 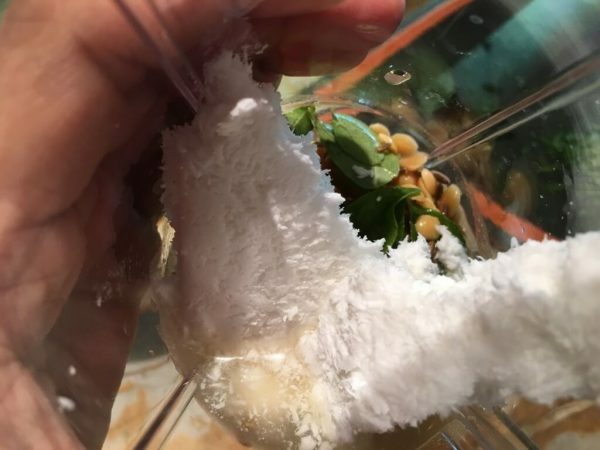 My sister has sometimes blended silky tofu in the place of coconut for a healthy, protein twist. I have tried it, and you can't taste the tofu!